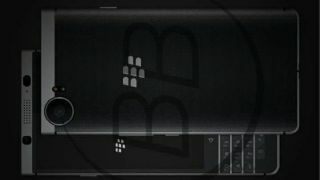 Just yesterday a new handset believed to be called the BlackBerry Press got officially teased ahead of its expected launch at CES 2017, and, while the teaser didn’t give much away, we may have just seen the handset in full, with leaked renders showing off the front and back of the device. The images, which were shared on Weibo, are accompanied by a decent spec list and show a phone with an apparently 4.6-inch touchscreen, with a keyboard below it, while there’s a rather large camera lens on the back. Sadly, the specs of the camera aren’t listed, but others are, including a Snapdragon 625 chipset, 3GB of RAM, 32GB of storage and a 3400mAh battery, all of which largely lines up with an earlier leak, which added that the rear camera is apparently 18MP, with an 8MP one round the front. Despite yesterday’s tease suggesting the phone was called the BlackBerry Press, it’s actually listed as the BlackBerry DTEK70 here, which would mark it as part of the same range as the BlackBerry DTEK50 and BlackBerry DTEK60. Calling it the Press might make more sense though, as the other DTEK handsets don’t have physical keyboards, making them quite a different proposition. Whatever it ends up being called, we can assume that it will include BlackBerry’s DTEK software for security and encryption, which along with the keyboard is likely to be a major selling point of the phone. We should know soon, as the same leak notes that the BlackBerry Press will be announced at some point today, which likely means we'll see it at CES 2017.